February is officially here; are you still sticking to your resolutions? For many people, the New Year brought a commitment to making better food choices for the purpose of improving personal health, but the scale isn’t the only thing that can be affected by diet. 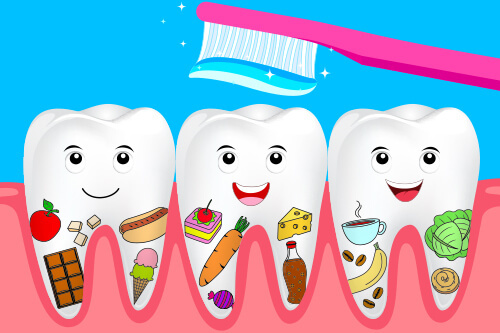 Did you know the foods you eat could also be affecting your dental health, too? It’s not too late to make healthy changes for 2018. In today’s post, we’re breaking down 10 popular foods that can damage your teeth. You can’t go anywhere without being tempted with soda. The fizzy beverage is a favorite among both children and adults, but it can also be bad for multiple aspects of your health. The sugars in sodas feed bad bacteria hiding in the mouth, which can cause cavities, but sugar-free isn’t much better. In fact, all sodas contain harmful acids that can leach important minerals from the teeth and make them more susceptible to decay. Ice in and of itself is not harmful to anyone’s health. In has no calories, no sugar, and is a source of hydration. Chewing on ice, however, can create tiny fractures in the enamel, and perhaps even cause breakage. Lower your risk of a dental emergency this year. Stick to using ice for chilling – not chewing. Despite their low calorie content, pickles may not be so great for your health. The vinegar they are soaked in can be highly damaging to the teeth – especially if you consume pickles on a frequent basis. That doesn’t mean you can’t enjoy them on your favorite sandwich or at your next cocktail party. Just be sure to thoroughly rinse your mouth of vinegar residue after you finish. This one requires a little explanation, as no one is implying that fruits and vegetables are in any way bad for your health. However, you may want to reconsider how you prepare them. Things like apples, raw carrots, and even corn on the cob can put extreme pressure on the teeth. If your teeth are weak, this can cause a break or even a tooth loss. Instead, consider cutting your corn off the cob and cutting apples into bite size pieces. You might also want to steam your carrots to soften their texture before eating them. These are some of the worst offenders when it comes to your oral health. Not only are candies filled with sugar, which can lead to decay, but hard candies and things like taffy can loosen the teeth or cause breakage if you chew them. Though you’re better off if you avoid candy altogether, there are still safer ways of satisfying your sweet tooth. Try sticking with a softer candy with low sugar, such as a piece of dark chocolate. Just be sure to brush your teeth after eating. Do you have a favorite food on this list? If so, what are your plans for better caring for your teeth in 2018? If you are looking for a new dentist in Katy or have questions about what to expect at one of our office check-ups, give us a call at (281) 492-8900 to speak with one of our helpful team members. We look forward to serving you soon.